Have you ever painted on cookies before? We had so much FUN doing this and it was such a nice change of pace compared to the usual sprinkles and frosting decor! It is so unbelievably easy to do and has beautiful results...as you can see here. 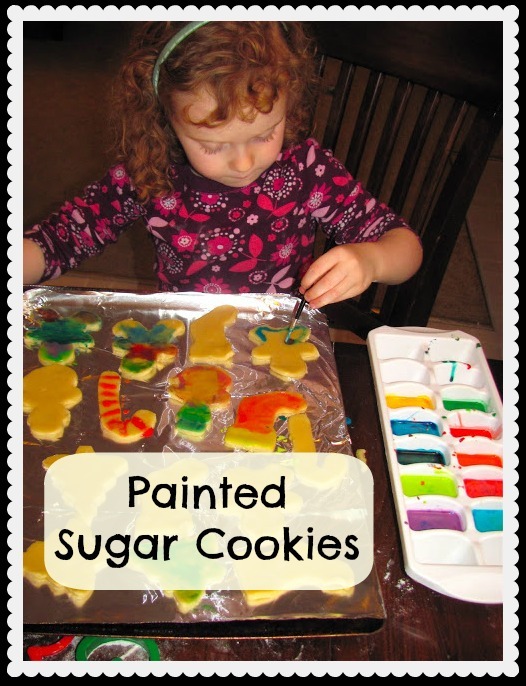 Painting on cookies is a great way for kids to take ownership of their cookie creations!!! Keep reading to find out how we did this! First we made the sugar cookies and cut out the shapes. Cassie never tires of this...it is the third or fourth time we've done this so far this holiday season! Here is a great recipe for Sugar cookies here just in case you don't have one. For the paint we used evaporated milk and food coloring. I just filled an ice cube tray with evaporated milk in each section and then put a few drops of food coloring. I mixed them together with a toothpick. We used a new paint brush that never touched real paint for the decorating. After mixing up the paints, we painted directly on the uncooked cookies. C and I had a wonderful afternoon painting cookies. She was so proud of herself! We felt like "Cookie Artists" creating little paintings on dough. Fun, fun, fun! Can you believe I've never done this before? I absolutely LOVED doing this and plan to do it for other holiday sugar cookies! Here is how some of them look before they are cooked. Sorry about the glare of the foil in this picture! Here are some finished cookies all ready to eat! I love the shiny look they have, and of course they are delicious too! The center cookie of C's traced hand looks a little like a Halloween cookie with those green fingernails!!! What do you think? Gosh... we've done a lot of baking for this holiday season. Be sure to check out our Cocoa Press Christmas Tree Cookies, Chocolate Christmas Sugar Cookies, So Easy Peppermint Bark, and more that I haven't posted! Do you have all your Holiday baking finished? this is one of the nicest cookie decorating ideas I've seen in a long time. They turned out beautifully, and I love that the process is so involving for the child. Thank you for your wonderful Christmas ideas this season. Happy Holidays to you and Cassie! I remember doing this as a kid! Your cookies turned out beautifully! Such a wonderful change of pace for decorating cookies. I featured your post on the Montessori MOMents facebook page. Thanks for all you do to inspire and enlighten us! What a wonderful idea! We used food coloring to paint on baked cookies, but not on raw. I've gotta try this - even though it's probably going to be after the holidays by now. These look delicious, love them! Beaded Snowflakes.....and Happy Winter Solstice! Paint Chip Candy Cane Garland!! !